Athens, Greece (AINA) -- An Assyrian genocide monument was erected yesterday in Athens, Greece, where 8,000 Assyrians live. The monument is a memorial for the Assyrian victims of the Turkish genocide of Christians in World War One, which claimed 750,000 Assyrians (75%), 1.5 million Armenians and 500,000 Pontic Greeks. 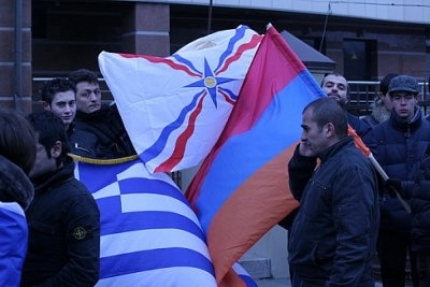 A new Assyrian genocide monument will be erected in the capital city of Greece, Athens. After having genocide monuments in the USA, Australia, Russia, France, Belgium and Armenia, the new monument will be erected on October 19th, in St.Spyridon Square, in front of the church of St.Spyridon, in Egaleo, Athens.